On Wednesday, August 29, beloved Indy beer bar Twenty Tap celebrated its first anniversary. And where were these ace reporters? We were...not there. While we heard that the party at Twenty Tap was fantastic, we were trying to broaden our craft beer experiences in this town. 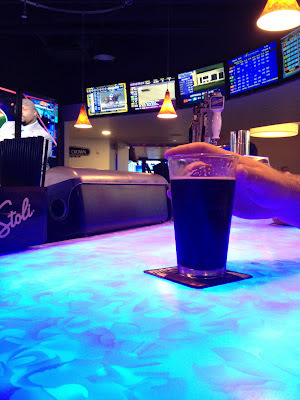 So we opted for a visit to the Winner's Circle Pub, Hoosier Park's off-track betting establishment, because we'd heard great things about their tap list. And besides, who doesn't want to experience the thrill of betting on horse races and the splendor of a lit bar top...that changes colors! We were pleased to see that all of the tap handles save for one were reserved for craft selections, and most of them were local selections (among them Oaken Barrel, Flat12, and Sun King). Looking yet again to expand our local beer horizons, we decided to review one of Triton Brewing's flagship beers, Deadeye Stout. Triton's brewery also happens to be in a refurbished horse barn, so perhaps we just had horses on the brain. When the HBG crew suggested that we have our next roundtable at Winner's Circle OTB downtown, I was a little more than apprehensive. Would we be reviewing Blue Moon while losing our paychecks on Space Jam and The Letter P? As it turns out, Winner's Circle has a great selection of local craft beer and absolutely no Bud, Miller or Coors on tap (although they may have had Blue Moon). 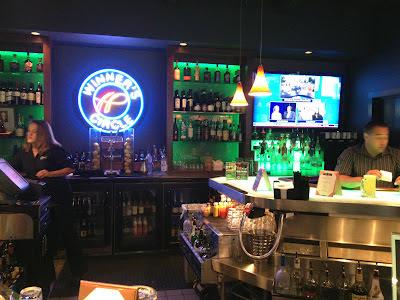 While I was still empowered to lose my paycheck through off-track betting, the psychedelic colors of the bar held my attention long enough to avoid betting on Scorpion Juice. As if 100 TVs and a broad selection of Indiana beer wasn't enough, $4 pints certainly sold me on this place. And that wasn't even a special, the special was $3 pints on Sundays. From the selections, we decided on Triton's Deadeye Stout. In retrospect, this was a terrible choice because the dark beer couldn't refract the colors of the bar. 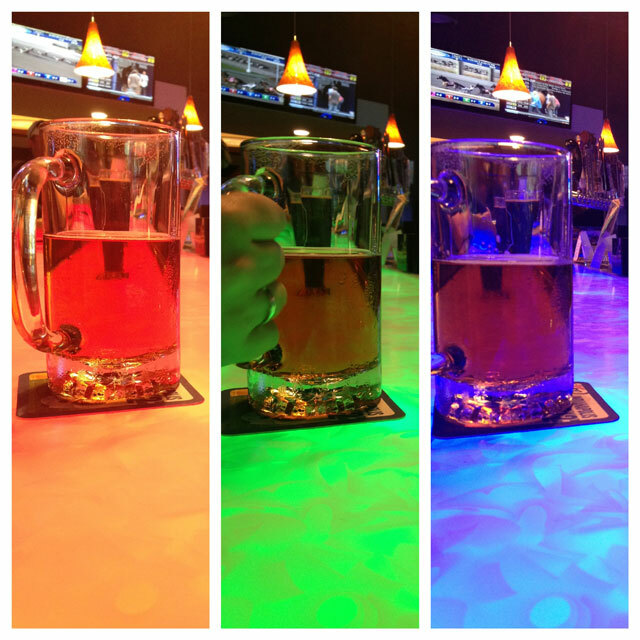 It's a good thing I enjoyed the beer enough to detract from my fascination with red, blue, and green. Deadeye Stout plays a convincing role of a chocolate stout before it reaches your mouth, with heavy aromas of dark chocolate and roasted malt. I'm pretty sure Deadeye Stout isn't a chocolate stout, but it certainly tastes like one, or perhaps a chocolaty sweet stout. Milk chocolate, cocoa nibs, and a hint of toast are all easy to pick out in the dark, sweet liquid. As dessert-like as I make it sound, Deadeye doesn't end up being too sweet, maintaining a nice drinkable balance in its sweetness and heavy body. It seems that many Indiana brewers have refrained from keeping a stout on their year-round tap list, so it's nice to find that Triton is bucking that trend. This was a very enjoyable beer and will be even more satisfying once the temperature starts to drop in a few months. 3.60 Mugs. I've never been to Vegas and I'm not much of a gambler, but I'm guessing that many of the venues there have a similar vibe to Winner's Circle. Over the top colors and sounds and the occasional burst of excitement (or frustration, depending on the outcome) from the crowd keep you entertained even if you aren't betting on the ponies. Best of all, they keep a heavy rotation of local beer on tap. Our selection for review was the Deadeye Stout from Triton. Seemingly a lighter stout as far as mouthfeel and texture, but a load of flavor really made this a pleasant and drinkable beer. Chocolate, roasty coffee, and caramel mingled about in a nice, black haze. 3.20 Mugs. If you're not careful, staring at the bar can result in hypnosis. At first when you mentioned Hoosier Park, I thought this pub was in Anderson, which is where I work. I was excited such an awesome beer selection would be in such a place as Anderson, but alas, there's still little in the craft beer world this city offers. I've had Triton's Fieldhouse Wheat and was a big fan of that, so I look forward to trying the Deadeye Stout soon. Thanks for the review!